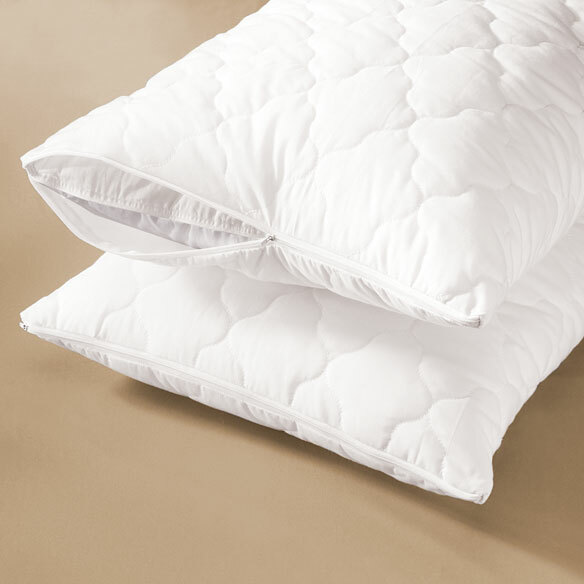 Quilted pillow covers add softness and protect from soiling and odors. Quilted pillow protectors act as a barrier against dust and allergens. Outer fabric is polyester/cotton; polyester fiberfill has polypropylene back. Set of 2. Machine wash and dry; made in USA. Specify: standard, queen or king. I love the way these covers cushion and makr your pillows softer.I used one and gave one to my sister because we both have problems sleeping due to our pillows. So much better now ? I have looked in many stores for quilted pillow covers to no avail. They used to be readily available everywhere but not anymore. I'm delighted to find them and plan to buy more. They wash well and become more fluffy too with washing. I'm very pleased. These quilted pillow covers are great, very comfortable and gives new life to my pillows. They are really great. I would not use a pillow without a cover and these really are supper quilted covers that add that extra bit of fluffiness. They extend the life of the pillow. I like how they give that extra support to my neck for a better night's sleep. I would buy them all over again if I needed to, but they do wear well and wash and dry easily. really makes a difference-----nicely done! I have the "My pillows" and they are even more comfortable. love them! These covers also contain the feathers. For many years, I've used covers for my pillows to keep them clean and to add additional coverage to keep from being picked by the feathers...I was so happy to find them in the Walter Drake Catalog...and, the price is right! Love these covers! Can't find in stores anymore. Glad I found them again. Bought 2 sets. Going to order more so I don't have to look for them again! Happy customer! Finally I have a source for what I want. I usually purchase rather expensive pillows and I want them to last. These pillow protectors definitely extend the life of of my pillows. They wash up so easily my pillows are always fresh. Thank you! I really like this product. I bought them twice. First time for old pillows. Second time for new pillows. Keeps the new pillows fresh and new looking for a long time. Good investment. I wash my pillows often but they still don't look clean. These new covers make them look like they smell, fresh and new! Thrilled to find these available! I was thrilled to find a place where these were available, they are hard to find I had just about given up. These pillow covers protects your pillows so they stay nice and fresh. these qyilted covers are hard to find.I like the various sizes. You're one of the few places that carry these. I use them and give them as gifts. Again, I just wish they were cotton instead of polyester or whatever they are, would be cooler. These pillow covers transform an old dingy yellow pillow into new. If you have a feather pillow that has the pointed end of the feathers poking out this is a great solution. They really prolong the life of your old favorite pillow. Inexpensive, washable. Have purchased them before and will buy them again! Quilted pillow cover are exactly what I wanted! I am using these covers over the pillows in the nursing home that are plastic covered. Makes pillows much more comfortable, especially when person is too warm. I have difficulty getting rest due to neck injurys, this helps a lot with a new pillow I bought. After it's been washed & dryed it's soft & fluffy! No more ruined pillows beat to death in washer or airing outside for days. These protectors keep sweaty head smell from getting into pillow. I have some like it that are 8 years old and still fluffy. I needed these for spares. Quilted pillow covers are perfect for my needs. I was very happy with this purchase since my pillows were flat. The quilted pillow covers add volume to my pillows so I don't need new pillows. When we purchase expensive pillows, these are so perfect to protect that investment. Not only protect but it keeps the pillow clean and smelling like new. All the pillows in my house have these, with spares. I've also purchased them for my daughter and granddaughter and they too wouldn't be without them. They wash beautifully. This is my second set of these pillow covers. Cannot find the quilted ones anywhere be here. I bought my first set of covers 10 years ago and still using them. Bought this set for new pillows for my guest room. Love these for their feel, their ease of care and how they rejuvenate a well-loved pillow. I am pleased with all of my purchases..
Protects the pillow, too. Very comfortable to sleep on, with pillowcases. My husband sweats a lot at night, and these protectors, along with pillowcases over them, help me from having to replace expensive bed pillows all the time. I just remove them and launder them every time I launder my sheets & pillowcases. I wouldn't be without them. These pillow covers were better than I expected for the price. I have down pillows and they really cover them a lot better than what I had on my pillows. So glad you offer these quilted pillow covers! Hope they're never discontinued! They are just what I needed to renew our favorite and wonderful old bed pillows. Have had our king-size bed pillows for a number of years and have tried replacing them, but never am happy with the new pillows because they're never as comfortable as our old broken-in pillows -- so covering our favorite pillows with these quilted covers made them look and feel brand new! Have ordered a back-up set of these coveres to keep on hand too. This is actually the third set of pillow covers I have ordered over a period of 5 years & I still have the first two sets, very happy with my purchase. My old pillows are finally "fluffy!" :) Love these! Only pillow cover to keep pin feathers from poking through. I WILL BE buying more soon! I had been looking for quilted pillow covers at all the local stores that carried bedding, but had not found them. I was pleased to find them on line, and after checking several places ordered the Miles Kimball set because of the price. I am very pleased with the quality and would definitely order again when there is a need to do so. I like having these covers on my pillows before I put the pillow cases on. These are perfect and I will by them, again, when needed. I have searched and searched. This is the best quality zippered pillow cover and the only one I have found that is quilted on BOTH sides. They cost a lot more elsewhere and you only get one. Miles Kimball you gives two! I didn't realize I would get two, so when I ordered two I ended up with four, but just try to get them away from me! No negative, only positive. Keeps your pillows fresh, wash the covers at least once a month. So glad to find these. They are so helpful to keep pillows clean. They wash nice also. great item. Great for feather pillows so the feathers do not poke you in the cheek. They've done a great job at making my pillows last longer so I've bought one for each pillow in the house. I purchased 4 sets and have them on all of my pillows. They are much more attractive than the regular pillow covers that aren't quilted. They do not look like pillow covers when on the pillow, but like the actual pillow. You can wash these innumerable times and they still look great. I could not find them in any of my local stores so when I saw them in the catalogue I scooped them up. I am extremely pleased with the quality and appearance. They still look new after five washings. These are a great buy! they help your pillows keep there shape better than without. I bought these cases for a coutoured pillow with a dimple in the middle, & the fit is great! It is soft & flexible enough to conform to the shape, & it made the pillow even more comfortable. Was happy with these covers. Hard to find item, but saves 'less than perfect' pillows. I'll buy these again. I have been using these for a long time. I am very please with them. I wouldn't want to do without them. I was looking for pillow covers that would fit my larger queen memory foam pillows, and these do the trick. Easy to put on and take off, and launder nicely. I like these pillow covers because I can just wash them instead of the pillow. However, I keep ordering because quality and prices are great. I will purchase these again in future! Love the zipper; make sleeping more comfortable. Needed something to keep the allergens from getting inside the pillows and these work great. Also easy to clean....just slip off and through in the wash. It covered our gusseted feather pillows easily with extra space on the ends. It helps to keep feathers from feather pillows from sticking you in the face at night and your pillows cleaner. These hard-to-find pillow protectors are pretty nice. They are quilted on both sides. I ordered all three sizes and the standard and queen sizes were fine, but the king size was mis-marked, and was really a queen size, I returned it for a true king size, but they refunded my money instead. Now I have to re-order the king size. Hope they send me a real king size this time. I used these covers to give more support and shape holding ability to my feather and down pillows, and they work great. These are a great way to get that extra mile out of old worn out pillows. Hard to find these nice quilted pillow covers. I looked for quilted pillow covers for a long time before I found them in the catalog. They are nice quality and wash well. Disappointed in this purchase. Very thin. Definitely not as good as my old thicker ones. Can't find in any stores anymore so bought online sight unseen. They wash and dry well, BUT not all are sized the same. One is 3 inches longer than the other. About as much pillow protection as the cheap non-quilted kind. Bought 2 sets a few months ago and right out of package, a strong chemical smell on the cases was evident that needed 2 washes to eliminate. All seemed fine until last week when the washed cases came out of the dryer with the same odor again! Then, to add insult to injury, when I went to zipper up one of the clean cases, the zip pull came right off in my fingers! Never again! Have purchased these before but quality was twice as good. Used to as pillow protectors. Easy to wash and reuse. I CAN'T USE PRODUCT FOR WHAT I BOUGHT IT FOR, TO EXPENSIVE TO SEND BACK SO I AM STUCK WITH A NON USEABLE PRODUCT. THIN MATERIAL, NOT WHAT YOU WOULD EXPECT FROM DESCRIPTION OF PRODUCT. NEEDS TO BE REPLACED AS THE ZIPPER UNRAVELED WHEN I WASHED THEM. Fabric was thin and cheap. Very disappointed, not "quilted", paper thin. Standard pillows so ordered standard/queen covers- tight fit- hard to get on pillow. I've used quilted covers for years and have suddenly been unable to find them, so was happy to see these. Unfortunately, this was a complete waste of money because after one washing these polyester ones are fraying around all the edges, basically falling apart. Others I own have been in use for many years, are still holding their shape, and are in need of replacement only because they've been through so many washings. These covers are so thin and flimsy that I'm not sure they'll survive even a month. Found some nice cotton-rich quilted covers made by Medi**** (for Waterbase pillows) that fit, wash and wear well. Easy Comforts may want to look into these instead because I'd buy more of THEM in a heartbeat! Looking for these padded protectors & all reviews were great. Couldn't find in store locally and my mom wanted them. I have feather pillows and the the stems of the feathers poke through the pillowcases a lot and they hurt when they poke out, so I thought these quilted covers would help make the pillows much more comfortable. Couldn't find what I wanted in store. Hoping this is what I have been looking for! An excellent cover for My Pillow! These are family gifts. just what I was looking for at a good price--hope the quality is good---will let you know! I can't find the QUILTED pillow protectors in any of the regular stores where I shop. I did not choose king size. I ordered regular. I hope this can be cleared up before shipping out to me. Thank you very much. D.C D of WA State. My old ones needed to be replaced. Not available in home town. They keep my pillows from going flat. I have had these pillow covers before and they are great way to save on new pillows and/or puff up old pillows. covers off to wash them. Good reviews & good price for a set of 2 pillows... I hope they are great as I expect them to be!! I've ordered these quilted pillow covers before from you, and I love them. They make the pillows very comfortable. They launder well and last a long time. Could not find quilted protectors anywhere in the stores. BEST ANSWER: Polypropylene is a kind of plastic. My opinion is that it helps to hold the quilted part of the pillow cover together when you laundry it. It does not change the feeling or texture of the side of the pillow case that you might put your head on. I have laundered these cases repeatedly and they are just as fine as they were when they arrived at my home. Thank you for your question. Polypropylene a synthetic resin that is a polymer of propylene, used especially for ropes, fabrics, and molded objects. We hope this information will be of help to you.